Not much to report in the home renovation department. We did a lot of cleaning and dump runs over the weekend. 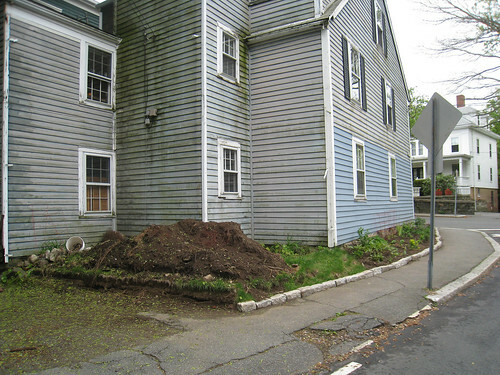 After a few “discussions” we decided to move the dirt pile to the corner of the driveway. 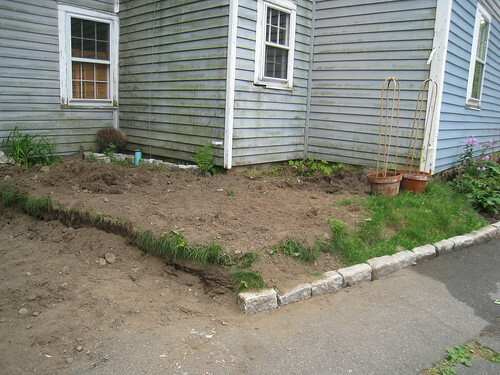 We were battling back and forth if we wanted to put a raised bed in the driveway area. Raised because we have a giant root system which makes it impossible to dig and we have a bit of run off. We “discussed” a hundred different designs for the project. None of which we could agree on. The project ended when I had a meltdown at the lumber yard and yelled, “Just move the f*cking dirt out of my patio area then! !” Yeah, I was that crazy lady. So on Sunday we moved the dirt to the driveway so that I can continue digging out my soon to be patio area. I’m trying to keep it simple for now maybe just add some pea gravel, outdoor furniture, and some planters. Plans are up in the air for the renovation of the back side of the house. Pea gravel is relatively inexpensive and can be moved easily. The area is such an eye sore I just want it cleaned up so I can get outside and enjoy the nice weather. 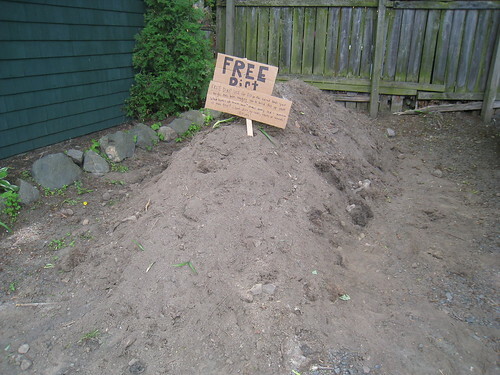 I made a “Free Dirt” sign and stuck it the pile this morning. I tried to make it funny and left a side note below. Hopefully someone will take it away. What else do you do with dirt? If you put a listing on Craigslist someone will def. come and pick up the dirt. LOVE your crazy lady quote. Your blog is so wonderfully wholesome- it totally cracked me up to envision this scenario. Love the sign. I need dirt for my garden but your way to far away. They say every rain drop is sowed from cloud dust, expect more where that came from! This is so funny, because we're getting quotes on some landscaping renos and the 64,000 question is where to put the dirt? Who knew it would be so hard to get rid of. Hahaha, aren't those days just the worst? 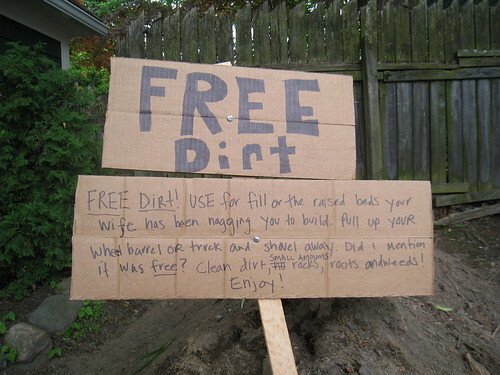 At least you've come to a conclusion :) And I still think your dirt sign is awesome! Thank you so much for this post! I laughed so hard. Sounds like a typical day at my house. I've really been enjoying your blog (in a lurker capacity). Just wonderful.